We are here to help answer any of your questions! Please check out our frequently asked questions and if these don’t answer your questions please contact us at 1-800-247-0006 or email us. Who can I contact if I have questions about my account delivery options, credit terms, or payment options? Our Customer Service Representatives are here to help you anytime with any questions you may have. Please call us at 1-800-247-0006 and we’ll be happy to assist you. We have several convenient payment options for you to choose from. We accept all major credit cards, checks by phone, debit cards, have online payment options, and offer an ACH electronic withdrawal option. As always, payments by mail and in our offices are still accepted as well. Call 1-800-247-0006 or visit our online site at http://bbpropane.billtrust.com to arrange a payment. What are your credit terms and payment options available? For our credit terms and payment options; this is specific to terms of either ‘Net 30’ or ‘Pay In Advance’. ‘Net 30’ terms mean you qualify for all of our available options. You may enroll in any of our Contract Pricing Programs. See our “Cost Saving Programs” page for further details on these options. Your required payment due is dependent on which program you choose. If you decide a Contract Pricing Program is not for you, you can buy your deliveries at retail pricing when you need them. You have 30 days to pay your invoices in full. However, if you pay in full within 10 days from your delivery, you can take a $.10 per gallon discount on your delivery price. ‘Pay In Advance’ terms mean charging is not allowed. All deliveries or service work must be paid for in our office before services will be scheduled. The Contract Pricing Program option available to you is our PrePay or 3-Pay Program. See our “Cost Saving Programs” page for further details on these options. I am delinquent on my bill. What can I do? Once an account is delinquent, all deliveries are placed on hold. Deliveries cannot be resumed unless the account is paid to a current status. We encourage you to contact us as soon as possible at 1-800-247-0006 to discuss payment options to bring your account current and prevent any delays in your deliveries. For our delivery options there are 2 choices: “Worry Free” or “Will Call”. With our “Will Call” delivery option, you are responsible for watching the tank and notifying us when you need a delivery. If this is your preference, we will be happy to take care of your deliveries this way. Since the delivery season can be a hectic time, we recommend you call us for a delivery when the tank is on 25-30%. This will ensure plenty of time to get you scheduled and get a delivery to you before the chance of the tank running out. We require a minimum 4-5 business days notice when placing an order. However, we do understand there may be times when you have forgotten to check the tank and call us when the tank is low and you need an immediate delivery. If you are requesting a delivery within 2 business days, we must assess a trip fee because this pulls our drivers off the routes and deliveries they are already scheduled for. Also, if your tank is out of gas when we deliver, we are required to perform a safety leak check on your system and an out of gas fee is assessed for that. Please remember if we need to perform a safety leak check on your system, an adult must be home during this time for us to perform the test. For specific delivery charges and requirements, please call 1-800-247-0006. What are my costs for a delivery? Because pricing fluctuates daily, we cannot give you a set price or hold pricing unless you are enrolled in one of our Contract Pricing Programs. If you are enrolled in a Contract Pricing Program, your price per gallon will be the price on your contract. This price will not fluctuate or be affected by retail pricing; it will be the same price for the entire time of your contract. (See our “Cost Saving Programs” page for further details.) If you are not enrolled in a Contract Pricing Program, your price per gallon will be quoted to you when you place your delivery order. If you do not call in to place an order (if you are “Worry Free” you do not need to call in, your deliveries are made automatically), the price per gallon will be whatever the retail price is at the time of delivery. Do you have any delivery fees or extra costs? For our customers with “Worry Free” deliveries, there are no delivery fees or extra costs because your deliveries are automatically included on our driver’s routes. For our customer with “Will Call” deliveries, our normal delivery time is 4-5 business days from when your order is placed (or from when payment is received for customers with ‘Pay In Advance’ payment terms). This means once your order is placed (or payment is received), your delivery will be scheduled into the driver’s route within 4-5 business days in which case there are no delivery fees or extra costs. However, if you request a delivery to be made sooner than the 4-5 business days, a delivery fee may apply. A delivery fee may also apply if a delivery is requested after hours, on weekends, or on holidays. Extra costs may also be incurred if the tank is out of gas when we deliver. Be sure to inquire about any fees when you place your order and our office can provide those details to you. When can I expect to receive my propane delivery? Once we receive your new customer application and have processed it, we will contact you to finalize any details to finish setting up your account. After that, receiving your deliveries will be based on the delivery option, credit terms, and payment options on your account. “Worry Free” customers can expect to receive their deliveries when the tank is between 15% – 30%. “Will Call” customers can expect to receive their deliveries 4-5 business days after you have placed your order. Customers with ‘Pay In Advance’ payment terms can expect to receive their deliveries 4-5 business days after payment for the delivery has been received in our office. Do I have to fill my tank each time I get a delivery? Absolutely not. You have a choice to fill the tank, receive only the minimum delivery which is 250 gallons, or get any amount in between. If you request an amount lower than 250 gallons, an additional fee may be incurred. (The fee is not applicable to smaller capacity tanks that are unable to hold 250 gallons.) Be sure to inquire about any fees when you place your order and our office can provide those details to you. I said to fill my tank but it’s only around 80%, Why? Because propane expands as temperatures increase, we only fill the tank to 80-85%. We consider this range a “full” tank. We will not fill a tank to 100% because there would not be room for the propane to expand within the tank and this would result in a safety issue. I let the tank run out of gas. Now what? Contact us at 1-800-247-0006 to get your delivery scheduled. Because your tank is out of gas, we are required to perform a safety leak test on your system. There will need to be an adult present when we deliver and perform the leak test. There may be an additional fee for the leak test. Be sure to inquire about any fees when you place your order and our office can provide those details to you. Does B&B Propane provide service for my propane appliances? Unfortunately we do not provide service for any appliance repairs needed inside your home. Depending on the service needed, we suggest you contact an appliance repair business or a heating and cooling business. What are my costs if I need a tank set? Because costs can vary depending on our customer’s needs, our office will review any costs associated with a tank set prior to setting the tank. Additional details such as tank rent, parts or materials needed, and tank set specifications will be covered with you prior to the tank set as well. What are the costs to repair a tank? Maintenance and tank repairs can range from minimal to very costly. Once inspected, our service technician can provide details and an estimate on the cost to repair your tank. If you are renting/leasing a tank from us, the cost to repair the tank is covered by us. If you own the tank, the cost to repair the tank is your expense. I would like my tank moved, can I do that? We encourage our customers to contact us before moving any equipment. There are distance requirements and specific setting guidelines that must be used when setting a tank. In addition, tanks are extremely heavy and can be very hazardous and cause severe personal harm if not handled properly. Our service technicians are trained and have the expertise to relocate your tank safely. Please call us at 1-800-247-0006 to discuss the relocation of the tank. I hit my gas line with my lawn mower. Now what? We understand accidents may happen. We encourage you to call us immediately at 1-800-247-0006. We will get a service technician to your residence to assess the situation and get it repaired. How do I turn off my propane tank? 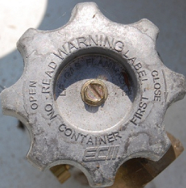 There is a valve on top of your tank that resembles the style of an outdoor water faucet handle, similar to the picture to the right. Turn that valve all the way to the right (clockwise) until tight. If you are unable to turn the valve, are unsure how to turn the valve off, or have any problems please call our office at 1-800-247-0006. Please be aware once your tank is shut off, a safety leak test must be performed at the time the tank is turned back on. Please call us to schedule a leak test before you turn the tank back on. How can I tell how much is in my propane tank? There is a percent gauge located on the top of the tank. Read the gauge as you would a compass; be sure to read the pointed end of the needle. The pointed end of the needle will be pointing on the percent in the tank. For example, if you have a 500 gallon tank and the needle is resting on 55%, you currently have approximately 275 gallons in the tank (500 x 55%). Helpful Hint- On occasions the needle can stick especially during cold weather so we suggest people tap the hood back down on the tank a couple of times. (The hood is the dome that covers the gauges; you have to lift it up to see the gauges.) This helps get the needle unstuck. Never use anything to directly tap the gauge itself or the glass on the gauge as it can break easily. How much is it to buy a tank? We do not sell tanks at this time. Is it ok to paint my tank? For safety reasons, specific paint, including the color of paint, is required. Before you begin painting, please contact our office at 1-800-247-0006 and we will discuss these requirements with you.